The Food and Drug Administration (FDA) has announced that BLM Prod.u. Vertriebsges. 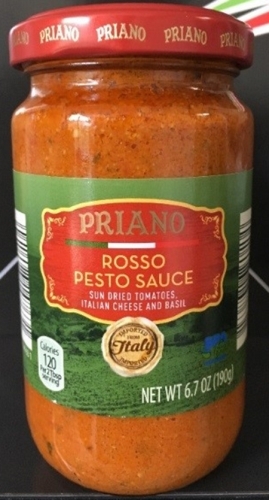 mbH & Co. KG, is voluntarily recalling Priano Rosso Pesto Sauce. The impacted Pesto Sauce may contain undeclared milk and egg. People who have an allergy or severe sensitivity to milk and egg run the risk of serious or life-threatening allergic reaction if they consume this product. To date, no illnesses related to this product have been reported. No other ALDI or BLM products are affected by this recall. The product was also available for purchase to ALDI customers in the Atlanta, Chicago, Dallas and Los Angeles areas through the company’s partnership with Instacart, a grocery delivery service. Customers who have purchased the affected product, should discard it immediately or return it to their local ALDI store for a full refund. For additional information, customers may contact ALDI Customer Service via www.aldi.us/customer-service or call 800-325-7894, Monday – Friday between 9 a.m. and 5 p.m. CST.